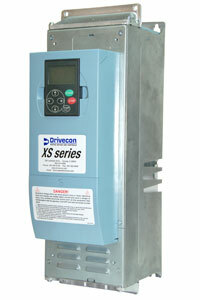 Drivecon's XT Series is the future of the crane industry! and well-supported range of drives designed for cranes. and for the future to come! Loadlock is the industry's first snag load prevention feature that proactively minimizes the effects of operator induced shock loading. Loadlock is a free feature available on all Drivecon closed loop hoist invertes. View a short video here! Sway Control is a simple means of achieving a reduced cycle time, and improved maintenance intervals. As Sway Control is bolt on technology that effectively compensates for load swing by means of actively monitoring the hook height, it can also enable faster operator learning curves and effectively make the crane sager to operate. Brake Slip protection is a feature that can be activated when the inverter is programmed for closed loop hoisting control. Effectively, it actively monitors the hoist motor encoder pulses and if it detects that the holding brake has failed, it will hold the motor at zero speed and signal the operator. See the service manual for more application, service, and operator training information. crane into or over a specific area. Any process which could benefit from reduced cycle times could benefit from Automatic Positioning functionality. This can include any number of pick/drop points and can even include predetermined optimized routes to gain the best in process efficiency and safety. to the most severe environments. Sway Control is a simple means of achieving a reduced cycle times, and improved maintenance intervals. As Sway Control is bolt on technology that effectively compensates for load swing by means of actively monitoring the hook height, it can also enable faster operator learning curves and effectively make the crane safer to operate.